Much ink has been expended over the artistic felicity and aesthetic acuteness of Raghupati Sahay Firaq Gorakhpuri (1896–1982) – one of the most admired poets of the subcontinent, who was also instrumental in transforming Urdu love poetry into a repository receptacle of multi-layered human consciousness that transcends the time and space barrier. Surprisingly, his wide-ranging, wholesome, discerning and equally forceful prose, containing a meticulous and candid, critical insight has hardly been subjected to dispassionate and assiduous evaluation. Seldom do Urdu scholars and critics focus on Firaq's perceptive and sharp-witted criticism, which he practiced for almost three decades. There is no denying the fact that some Urdu critics have cursorily referred to his three books Andaze (1959), Urdu Ki Eshqia Shairi (1945) and Urdu Ghazal Goiee (1955) but they peremptorily describe him as the impressionistic critic, whose critical evaluation is based on interpreting the text in the backdrop of human emotions and impressions and who concentrates on conveying initial and stock responses which a piece of art may evoke. He takes pride in recreating the experience of the author, in the minds of the readers. The onus of propagating such a mistaken notion rests with Firaq himself, who, on several occasions, including in the preface to ‘Andaze’, showed his penchant for impressionistic and aesthetic criticism. Firaq disagrees with the widely-accepted literary assumption that the spontaneous appreciation of poetry or the acclamation that a poet gets at any poetic symposium falls well short of criticism and most of the time, this sort of quick assessment proves to be misleading and erroneous. It seems incredible to think that a 30-year-old who uses words and a painting brush with equal felicity can pick up a language learning guide from the downtown market of Ahmedabad that is famous for “things that are not in currency” as it is the area where one hardly gets to see any shopping mall, food plaza or a multiplex. It is surprising that this is the place that makes him realise that there is a life that does exist beyond selling, buying and sensual pleasures. Soon he becomes fully conversant with the nuances and idioms of a language that is apparently incompatible with his cultural ethos, ideological concerns, his value system and religious beliefs; surprisingly, within no time, he has a command on the complicated and formidable prosody of that language. Eventually, his ever-increasing proficiency in that particular language, coupled with his creative dexterity earned him the prestigious Sahitya Akademi Award in 2009. It is not a piece of fiction, but what was achieved by Jayant Parmar. His transformation from a Gujarati poet and painter into an accomplished Urdu poet leaves many awe-struck. His poems make it clear that creativity transcends language barrier. His second collection of poems ‘Pencil Aur Doosri Nazmein’ got the Award of the National Academy of Letters – Sahitya Akademi – for Urdu in 2008. Jayant Parmar who has continuously been haunted by the repugnance of hell pit admits that the atmosphere around him was hardly conducive for any creative work. Notwithstanding widespread adulation for the creative dexterity of writers like Meer, Ghalib, Premchand, Manto, Firaq and Shaharyar. Urdu literature has often been viewed as inordinately influenced by emotionalism. 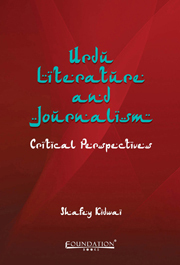 Urdu Literature and Journalism, comprising well-focused and cogently-argued essays, works out a new perspective on Urdu literature. The author weaves different strands of thoughts and new theoretical discourses reflected in various genres of literature to produce a kaleidoscopic portrait of contemporary Urdu literature. By analyzing the texts of famous Urdu writers in tautly-rendered poised prose, the book offers an alternative vision of our lived reality. The book also includes essays on Urdu journalism, tracing its history and development in pre- and post-Partition India. The contribution of Urdu journalism to the freedom struggle of India and its influence on the First War of Independence have been made clear through these essays. However, the contention of the author is to make it clear to the readers that Urdu journalism is more than just 'protest journalism' - a term which, he thinks, has been wrongly attached to Urdu periodicals. Since the short story, unlike poetry, frequently unfolds the humdrum of daily domesticity, it has been perceived as a body of writing that hardly transcends the common place experiences of life. Short story, by its very nature, zeroes in on a reality that is not only multidimensional and far more pernicious but also has an unpredictable element that shapes our day-to-day life. In line with its above-mentioned defining theme, the short story also turns our attention to some eternal verities that constitute the mainstay of human existence. It tries to highlight the wholeness and richness of an experience in its entirety by presenting things in diverse perspectives. Set in both urban and rural milieu, stories unfailingly form a template for coming to terms with external reality, and the trials and tribulations of the characters pave the way for self-discovery. The characters unfold themselves in dribs and drabs and one can also come across a plethora of protagonists whose actions are both self-revelatory and self-concealing. They show tacit support for lifelong rectitude. Urdu short story, right from the beginning, reflected its immense zest in focussing on ‘shimmerness of life’, a phrase frequently used by D. H. Lawrence. Pandit Ratan Nath Sarshar, Nazeer Ahmad and Mirza Hadi Ruswa laid the foundation of Urdu fiction and they depicted the multifaceted reality of life with rare dexterity. Seldom does a historical fallacy that becomes omnipresent, unwittingly give way to a well-documented and a painstaking research finding. This is the reason that a majority of scholars, who are turning their attention to the history of Indian journalism, still give credit to the Punjab University, Lahore, for launching the first course in journalism as early as in 1941, under the stewardship of Professor Prithivipal Singh. The course was later shifted to Delhi and then to Chandigarh. Next, it was the turn of the Aligarh Muslim University to introduce journalism as a specialised branch of academic discipline at its campus. According to Krishnamurthy, the Aligarh Muslim University offered a diploma course in Journalism in 1938 (Krishnamurthy, 1966: 174). Scarcely does a language endure as much agony in its own homeland as Urdu, and that too in the hands of those who describe it as the controlling metaphor of their distinct cultural identity as the majority of its native speakers, mostly living in north India, no longer use it as a means of communication, and the new generation is hardly even aware of its script. Still bearing the brunt of the Partition, Urdu finds it extremely difficult to preserve its script due to a continual fall in its use. However, notwithstanding the apparent decline, the language is still spoken by more than 60 million people (2001 census) in India and the literature in Urdu by distinguished poets and fiction writers like Meer, Ghalib, Iqbal, Premchand, Manto, Bedi, Firaq, Faiz, Nasir Kazmi, Ahmad Faraz, Intizar Hussain, and Shaheryar draws immense adulation from all quarters. Urdu has won a fair share of admirers for its ingrained quality of bringing different cultural sensibilities together as well as detractors for allegedly championing the cause of the Partition. In this backdrop, one has to study Urdu literature, and the articles included in this book are braced for understanding the dynamics of the power of cultural paradox that is evidently manifested in the case of Urdu. What kind of cultural and ethnic identity is being fostered by Urdu literature? Who are the prominent authors of the post-Partition Urdu literature? These questions are delineated in these articles that revolve around Urdu writers in India. This book, an assortment of twelve essays, is an attempt to analyze Urdu's inherent prowess of strengthening liberal values, pluralism and ingesting new literary trends, ideological positions and current socio-political discourses. No Urdu poet can vie with Mirza Asadullah Khan Ghalib (1797-1869) in terms of a dispassionate but uncontrived portrayal of the incongruities of human life. With a researcher's tenacity, he unwittingly transforms a myriad of experiences – sensuous, emotive, mystical and intellectual – into a unified pattern of unfading experience. His poetic method is clearly braced for converting the vagaries of daily life into excellent poetic material, interspersed with unsurpassable wit, and it leaves the literary critics and the common reader awe-struck. In 1809, when Ghalib was only 12, his poignant poetry came in for a consummate discussion in Takizra Umda-e-Muntakhiba. Having praised the merits of the promising poet, Meer Mohammad Khan Suroor, the annalist, compared Ghalib with Mirza Abdul Qadir Bedil, one of the great exponents of the Ghazal. According to him, Ghalib effectively emulates the poetic diction of Bedil. Suroor's early adulation proved to be a straw in the wind as much ink has been expended over Ghalib's sterling contribution to the Urdu Ghazal in particular and other literary genres in general. Since the publication of his Urdu ‘Deewan’, hardly can any critic resist the temptation of focussing on Ghalib, no matter how plausible or non-perceptive his interpretation might be. Ghalib's worldview and his matchless style, coupled with frequent use of paradoxes and witty comparisons or conceits has fired the imagination of innumerable critics and interpreters. Journalism, since its inception, has been perceived as the most effective agent of social activation, and no other social and intellectual activity can vie with journalism in propelling forward the process of social change. This is the reason that a number of political leaders, educationists, social reformists and ideologues of the pre-independence era such as Raja Ram Mohan Roy, Sir Syed Ahmad Khan, Pandit Madan Mohan Malviya, Lala Lajpat Rai, Mahatma Gandhi, Maulana Mohammad Ali and Zafar Ali Khan had started their periodicals, not for literary excellence or for carving out a niche for themselves in the power structure, but for moulding public opinion against the foreign rule. There is no denying the fact that their efforts bore fruits but their missionary zeal and rhetorical and polemical writings were not fully compatible with the epistemological and professional framework of journalism. Much has been written about Maulana Abul Kalam Azad's political statesmanship, unrivalled erudition and unequal intellectual eloquence in proffering a perceptive and innovative discussion on the topics having definite bearing on the metaphysical and physical aspects of life. His journalistic excellence, the hallmark of his creative genius, has also come in for detailed debate. It has been pointed out, time and again, that Azad's lucid but verbose prose style unfailingly charted a new path in Urdu journalism. India's awe-inspiring evolution from a fragmented, nascent and peripheral country to an invincible world power owes much to its inhabitants, who, notwithstanding their different religious, ethnic, linguistic and geographical affiliations, espoused the cause of nation building. Much ink has been spent over the invaluable contribution of different religious, social and linguistic groups and also the political parties who put up a fight against subjugation and exploitation but the stupendous contribution of the Urdu speaking people, especially Urdu journalists, has hardly been made the object of in-depth analysis. This chapter is aimed at supplementing what has been ignored deliberately or unwittingly, since long. Seldom does the Muslim-dominated, protest-prone Urdu press awake one's memories of the sterling role that it played during India's first war of independence. The contemporary Urdu press, the third largest numerically, has largely been perceived as a body of casual writing that borders on the highly sentimental ‘kitsch’. The debatable nature of such a widely-held view could only be deflated, if the role of the Urdu press, during the eventful period of the freedom struggle, is made the object of a close study. It looks pertinent to turn one's attention to Urdu journalists who wielded their pens to rouse feelings against the alien rule, as a result of which the British took severe punitive measures against them. The epistemological and theoretical aspects of literary theories have caused them to draw too much unnecessary attention towards themselves, especially with the publication of Khawaja Altaf Husain Hali's prodigious monograph, ‘Muqadma-e-Sher-o-Shaeri’ (Preface to the Debate on the Nature of Poetry) in 1893. The Preface is the first book in Urdu that goes beyond the unconditional glorification of poetry and actually tries to probe into what ails contemporary Urdu poetry. Hali, an accomplished poet, biographer, scholar and disciple of Mirza Asadullah Khan Ghalib, tried to turn attention to the theoretical and aesthetic stand point of evaluating literature objectively. In ‘Muqadma-e Sher-O-Shaeri’, Hali persistently puts together well established eastern and western canons for the appraisal of poetry. How does literature reflect external reality through language and rhetorical devices? What is the sort of relationship that exists between literature and individual and collective consciousness? How does poetry communicate with the reader? How does the poet along with the reader and the text, collectively give life to a piece of literature? Do social conditions leave an indelible mark on literature? These sorts of pertinent questions are assiduously discussed in the ‘Muqadma’ and Hali also delineates the distinctive features of various genres of poetry. Hali firmly believes in the mimetic representation of the external world through literature and his intent on simplicity, spontaneity and true depiction of reality, enabled Urdu criticism to release itself from the bond of opinion-centred assessment. Urdu, spoken by more than 60 Millions (2001 Census), has usually been, though erroneously, perceived as a language that draws heavily from ‘Erato’ or sensual themes. Seldom does its power of strengthening cultural pluralism by macerating the creative output of a number of eminent writers, get applause from different quarters. Contrary to the widely held view that it regurgitates the themes of many well-known Persian and Arabic poets, Urdu literature, since its inception, keeps an eye on the authors who write in the languages spoken in different parts of India. In line with its age-long resilience, Urdu literature turns its attention to Tagore, whose unmatched creative insight and marked accuracy of sensibility is reflected in poetry, fiction, music, painting, acting and teaching, in equal measure. It goes without saying that the multifaceted personality of Tagore fired the imagination of those who have a panache for good literature. Much before Tagore won the Nobel Prize, Munshi Premchand, who laid the foundation of fiction in Urdu, referred to him in his letters repeatedly and candidly, admitting that he had learnt the art of juxtaposing the mundane realities of life with eternal questions that constitute the mainstay of human existence, from Tagore. In a letter addressed to Munshi Daya Narain Nigam, dated September 10, 1910, he alludes to one of his unfinished stories that owed much to Tagore. Urdu, incorporating the heterogeneous aesthetic sensibilities, pluralistic perceptions, and different literary traditions which represent our age-old cultural and linguistic coalescence and shared social legacy, is certainly more than one of the languages listed in The Eight Schedule of our Constitution. Urdu, despite being derided by some quarters as a language of listless sophistication and mannerism, is essentially a creative accumulation of diverse cultural sentience including the emerging paradigm of subaltern discourse. It will not be an exaggeration to describe Urdu as a way of thinking and a style of life. It is what constitutes the much-admired mosaic of the cultural plurality of India. Urdu always espouses the cause of unity of humankind, broadmindedness, fellow feeling and magnanimity by deploring the feigned sectarianism. No one can pass over the longstanding tradition of brotherly love unfailingly propagated by Urdu. Creative genius of its widely admired poets such as Meer, Ghalib, Firaq and Faiz was extremely instrumental in making the plural, democratic and liberal Indian society. It is nothing but sheer injustice to equate such an elegant language to a particular religion. Urdu stunningly exemplifies the essence of Indian culture, tolerance and forbearance. Urdu is yet to get its rightful place in its birthplace, and the perpetual neglect of the language hardly goes with the pluralistic culture of the country. Much light has been shed on the poetic dexterity and awe-inspiring aesthetic sensibility of Faiz (1911–1984) but his literary, cultural, aesthetic, artistic and social concerns, lucidly exposed to view in his prose writings, both in Urdu and English, have hardly been focussed on. Sheema Majeed's compilation of his Culture and Identity, Selected English Writings of Faiz (2005) and a few pieces on his Urdu prose (see also ‘Faiz Ek Naser Nigar: Afkar Fair Number’ by Saher Ansari, ‘Faiz Ke Tanqueedi Ravaiyye’ by Ali Ahmad Fatmil, ‘Faiz Ahmad Faiz Bahaisiyat Naqqad’ by Shafeeq Ahmad Ashrafi.) aside, seldom does one come across any discernable attempt to sift through the whole corpus of his prose writings, available in the form of a number of articles, reviews, laconic essays, prefaces, blurbs or short introductions to books, reviews, letters, speeches, discussions, radio talks, TV discussions, lectures and presidential remarks. These writings unfailingly prove that Faiz was certainly more than an aesthete who takes delight in conveying impressions in a florid style that a piece of art may evoke. Most of his prose pieces are expository, evidently propelled along by the progressive canons of literature and many of them seem to have a pertinent point in them. The ideas get life in Faiz's tautly written prose and these pieces, embedded with fresh critical insights, establish his credentials as a sensitive critic. At times, his articles seem to make him a literary enthusiast whose writings are certainly more than the mere elucidation of pre-existent meaning. The first newspaper of India, The Bengal Gazette or Calcutta General Advertiser was launched in 1780, from Calcutta. An employee of the East India Company, James August Hickey was its founder; hence it was also known as Hickey's Gazette. A month earlier than that, the first Urdu newspaper, Jam-e-Jahan Numa was published from Calcutta. Its first issue hit the stands on 20 March, 1822. Harihar Dutt was its owner and Munshi Sukh Lal was its first editor. Urdu Akhbar was started by Moulvi Mohammad Baqar, a renowned scholar from Delhi. It was generally regarded as a complete newspaper that published informative and thought-provoking material on topics of public interest. Urdu Akhbar enjoyed enormous popularity. Urdu poetry, since its inception, has tried to capture completely, the conscious life, the cognitive life, life beyond the mundane realities, the life of desire and the anguish involved in extracting the meaning of the mundane realities that are ostensibly uncanny, macabre and sordid. Its most-longed-for genre, the Ghazal, drawing its sustenance from the sentimental and metaphysical notion of love, apocalyptic hyperbole, tenacious and multi-sensory imagery, still tweaks the curiosity of those who have panache for good poetry. The creative dexterity and aesthetic sensibility of some great Urdu poets such as Mir, Ghalib, Anees, Iqbal, N.M. Rashid, Meeraji, Faiz, Firaq Gorakhpuri, Nasir Kazmi, Akhtar ul Iman, Faraz and Shahryar, still receives widespread adulation. Their frequent and judicious juxtaposition of solitariness and heterogeneity is both awe-inspiring and ecstatic in effect. The Ghazal's immense popularity aside, Urdu poetry's tendency for sentimental exoticism that betrays a kind of rejoicing in pain, has prompted some critics to tear its self-collapsing and clichéd diction apart. They describe it as a body of atonal and mushy writing, bordering on a kitsch that harps on the themes regurgitated by the eminent Persian and Arabic poets of the yore. Despite this existent polemic in Urdu poetry, if various genres of the post-Independence breed of the poetry are sifted at once, both at the level of content and form, one will be able to see how Urdu poetry, as a whole, has broken away from the grotesque subversion of the normative requirements of neo-classical poetry.